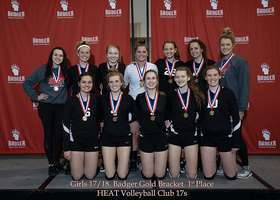 If you have any questions for HEAT Volleyball Club Fox Valley please contact Director of Operations, Kim Lee, at kimmlee6@gmail.com 920-419-3763 or Director of Coaching Tanya Blocksom at trblocksom@gmail.com 920-585-8239. Admin@heatvbc.org email box has been closed. Way to go 17s! So proud of you! It is has been a decade since Patty Blum founded HEAT Volleyball Club and it is with sadness we are announcing that Patty will be stepping down as the HEAT Volleyball Club Director. Patty has decided it is time to devote more time to her family and leave HEAT behind. There is no need to worry, as we have been blessed that two awesome ladies have come forward to continue running the HEAT Volleyball club. Kim Lee and Tanya Blocksom will take over as Co-Directors of the club. Kim has coached for HEAT for the last four years and Tanya has been coaching with us for the last two years. We will be working quickly to get them up to speed and get their contact information posted to our website. Please no longer contact Patty regarding club questions. You can now reach out to Kim Lee at kimmlee6@gmail.com or 920-419-3763 or Tanya Blocksom at trblocksom@gmail.com or 920-585-8239.